“Restaurant Kronborg serves potato ‘smørrebrød’ which make the angels sing,” says popular food blogger and urban farmer, Nada Louise Cay, to Danish daily, Ekstrabladet, in an article headlined COPENHAGEN AS A FOOD MECCA. “When I am in the mood for a treat or am having lunch with friends, I find Restaurant Kronborg a super cosy place with good ingredients – and they serve the best potato sandwich in town,” says popular food blogger and urban farmer, Nada Louse Cay, to Danish daily, Ekstrabladet in an article headlined COPENHAGEN AS A FOOD MECCA. Nada Louise Cay is Copenhagener for better and for worse, writes Ekstrabladet (mostly for better we imagine… ). She is an urban farmer with her own vegetable garden in her backyard, and develops recipes and write articles about food. On her blog, Lacucinanada, she focuses on sustainability and how to best use your ingredients in order to avoid food waste. 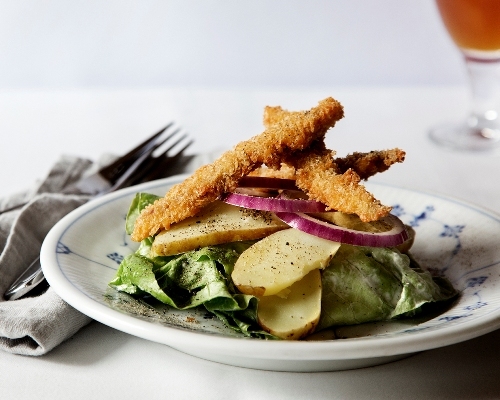 We make the potato sandwich, which Nada recommends, with crisp deep-fried anchovies and a traditional Danish tangy “granny salad”. It is one of our summer specialties, which we serve when the new crop of Danish potatoes arrives but obviously it can be enjoyed all year and we are happy to share the recipe. We thank Nada for the nice words and encourage you to read the entire article (sorry, in Danish only).